In order to assist schools and districts with the implementation of the Common Core, NYSED has provided curricular modules and units in P-12 ELA and math that can be adopted or adapted for local purposes. Full years of curricular materials are currently available on EngageNY for grades Prekindergarten through 12th grade in Mathematics and Prekindergarten through 12th grade in English Language Arts (ELA). How can I provide feedback on the curriculum modules? If you have any feedback on the curriculum modules, let us know by completing the Curriculum Feedback Form. We will review all feedback as we continue to make improvements to the materials. The optional curricular materials on EngageNY are designed to be adopted or adapted. Educators will find both PDF and Word versions available for their use. Some lessons provide detailed instructions or recommendations but it is important to note that the lessons are not scripts but rather they should be viewed as guides so that the reader can imagine how classroom instruction could look. Lessons are adaptable and allow for teacher preference and flexibility so that what is happening in the classroom can both meet students' needs and be in service to the shifts and the standards. If you do choose to make significant changes to lessons, the Tristate/EQuIP rubric is available to help you evaluate the quality, rigor, and alignment of your adapted lessons. Also, please note that the Math modules include a significant number of problem sets so that students have ample opportunity to practice and apply their knowledge. Educators can help students to achieve deep conceptual knowledge by asking them to complete selected problems that have been designed in a sequential, thoughtful order. It is not expected that all the problems in a problem set be administered, but rather educators can choose from the ample amount of problems provided. Educators may certainly adapt this curriculum using their own judgment regarding student needs and pace of the semester and/or year. 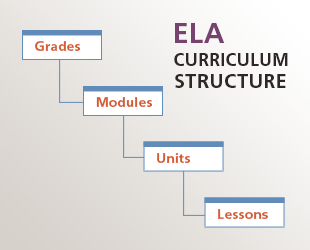 Curriculum materials for ELA subjects are structured into 4 levels of hierarchy. You can navigate by grade, then by various modules within the grade. Each module is divided into units, and each unit is further divided into lessons. 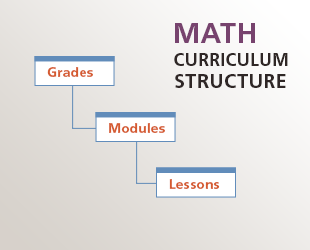 Curriculum materials for Mathematics subjects are structured into 3 levels of hierarchy. You can navigate by grade, then by various modules within the grade. Each module is then divided into lessons. Support teaching and learning in Pre-Kindergarten (Pre-K) through Grade 12 classrooms across New York State and provide access to sequenced, spiraled, content-rich statewide curriculum programming and instructional practices that support the attainment of the CCLS and align to the Board of Regents’ strategic goals. Include teaching and learning experiences that scaffold P-12 grade levels, are focused on P-12 learning progressions, and project a trajectory of learning standards in each content area (English Language Arts & Literacy and Mathematics). Incorporate curriculum maps, lesson plans, performance tasks, scaffolding materials, samples of student work, and other classroom artifacts. Newly developed modules will provide curriculum and instructional resources targeted to address all learners within any classroom setting. Students achieving and performing below grade level (up to two grade levels behind through grade 8, and up to four grade levels behind in high school, grades 9-12).